The outer layer of skin is called the epidermis. Epidermal cells include several different subtypes of cells, including the pigment-producing melanocytes. The deeper layer of skin is known as the dermis, which contains hair follicles, blood vessels, and oil and sweat glands. Skin cancers can arise from any of these skin cells. A biopsy is usually required to confirm the diagnosis of skin cancer. 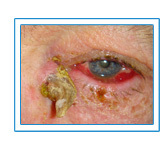 What are the causes of skin tumors around the eyes? Excessive exposure to sun is the single most important factor associated with skin cancers of the eyelid, face and arms. Fair-skinned people develop skin cancers much more frequently than darker skinned people. A predisposition to develop skin cancer may be hereditary. 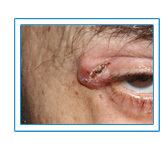 The most common type of periocular skin cancer is basal cell carcinoma. This tumor may appear as a painless lump or a sore that will not heal. The skin may be ulcerated or crusted, or may bleed. Normal eyelid structures, such as eyelashes, and the normally smooth contour of the eyelid may be deformed. Melanomas arise from the pigment-producing melanocytes. This tumor is much less common than basal cell but more serious in nature. A mole that bleeds or becomes tender, or changes in size, shape or color, should be evaluated by a specialist. Squamous cell carcinoma is another common type of skin cancer skin is very similar to basal cell. Are periocular skin cancers serious? Basal and squamous cell cancers enlarge locally and rarely spread, or metastasize. Left untreated they will continue to grow and invade the surrounding structures. If they are detected early and treated appropriately there is an excellent chance of removing the entire tumor with a very low chance of recurrence. Melanomas can metastasize to other parts of the body through the blood or lymphatic systems. Prompt aggressive treatment is necessary because of the risk of the early spread. Surgical excision is the most effective treatment for periocular skin cancer. There are two important principles in removing the tumors complete removal and reconstruction. Complete removal of the skin cancer is necessary to reduce the chance recurrence. Reconstruction of the defect is tailored to preserve eyelid function, protect the eye and provide a good cosmetic appearance. There are several ways to remove skin cancers involving surgery. One type is Mohs surgery, which is a technique to remove the lesion by removing layer by layer under microscopic control. The surgeon may also remove the tumor using frozen sections, which is often done in the hospital. In this instance, the surgeon removes the lesion with a small margin of normal tissue and the pathologist examines the specimen to insure that the entire tumor has been removed. Once the entire tumor removal is confirmed, reconstruction is performed. The area of the defect determines what reconstructive method is performed. Sometimes simply tightening the skin and placing sutures will allow a return of normal function and appearance of the eyelid. However with larger tumors, skin graft or mobilization of skin flaps may be necessary. Recurrences may occur even after complete excision of a skin cancer. Recurrence is more common if the lesion is not completely excised. Skin cancer involves the tear duct system. The eye may demonstrate excessive tearing afterwards. Bleeding and infection, which are potential risks with any surgery, are very uncommon. Is the skin eye surgery effective? Complete and early removal of the skin cancer is very important to reduce the chance of recurrence and also reduce the risk of spread to other nearby structures and distant parts of the body. Careful follow-up after the surgery is important to ensure that recurrence does not occur and also to look for new cancers so they can be treated promptly. Dr. Brazzo has treated hundreds of New York City skin cancer patients, especially those suffering from various types of cancer on the face, particularly on the eyelids. He specializes in Ophthalmology and Plastic Surgery, and has unique training in both removal and reconstruction of lesions and skin cancers around the eyes. A successful oculoplastic surgeon New York City patients trust, Dr. Brazzo has authored several book chapters and articles on this topic and has taught his techniques to doctors around the country. Dr. Brazzo treats various eyelid disorders, including ptosis, which can be ameliorated with blepharoplasty, also known as eyelid surgery. In fact, he is a leading eyelid surgeon New York City patients visit to address their aesthetic and reconstructive needs. He also helps aging men and women rejuvenate their appearance with facial fillers and Botox in Manhattan. Dr. Brazzo offers Latisse prescription for patients who suffer from inadequate eyelashes or wish to enhance the beauty of their lashes naturally.